The coffee giant says it’s solving the world’s water problems—yet it’s profiting off the Golden State’s dwindling reserves. Update, May 8, 2015: In a statement on Thursday, Starbucks announced it would be moving its California bottling operations to Pennsylvania over the next six months, citing concerns over the drought crisis. “We are committed to our mission to be a globally responsible company and to support the people of the state of California as they face this unprecedented drought,” John Kelly, the company’s senior vice president of Global Responsibility and Public Policy said. The idea quickly took off. In 2005, Ethos was acquired by Starbucks. Now, for every $1.95 bottle of Ethos water it sells, Starbucks makes a 5-cent donation to the Ethos Water Fund, part of the Starbucks Foundation. “When our customers choose to buy Ethos Water, they’re improving the lives of people who lack vital resources,” Starbucks CEO Howard Schultz said in 2008. Starbucks says that its partnership with Ethos has raised more than $12.3 million for water charity projects to date. So far, media coverage has focused on Starbucks’ goal to quench the thirst of the world’s parched masses; the story behind the bottled water it sells here in the United States has been a nonissue. But now, as California’s historic drought wears on, Starbucks is facing a water crisis of its own. Starbucks gets its spring water free of charge—in California, water companies typically don’t have to pay for the groundwater they use. 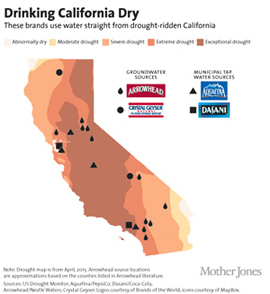 The bottling plant that Starbucks uses for its Ethos customers in the western United States is located in Merced, California, which is currently ranked in the “exceptional drought” category by the US Drought Monitor. Its residents face steep water cuts in their homes, and surface water for the region’s many farms is drying up. The Starbucks water bottled at the plant comes from private springs in Baxter, a small unincorporated community in Placer County, a few hours north of Merced in the foothills of the Sierra Nevada mountains. The spring water comes free of charge—in California, water companies typically don’t have to pay for the groundwater they use. When I asked a Starbucks spokesman about the company’s reaction to concerns about bottlers’ use of increasingly scarce water, he told me that Starbucks uses “a private spring source that is not used for municipal water for any communities.” But Mary Scruggs, a supervising engineering geologist with California’s Department of Water Resources, notes that communities can be affected by the use of surrounding springs “if you capture and pull it out before it ever makes it” to downstream users. The bottling plant that Starbucks uses is located in Merced, California, which is currently ranked in the “exceptional drought” category. Bottling companies are trusted to monitor the health of their springs and the recharge rate, though in California the regulation and monitoring of bottled water extraction and its environmental impacts is notoriously opaque. Unlike in other states, well logs are kept confidential and reviewing such data requires permission from the well owner. In addition to the spring water it bottles, Starbucks also uses Merced city water to manufacture its bottled water product. A report commissioned by the International Bottled Water Association found that it takes on average 1.32 liters of water to make a liter of bottled water, though critics argue that it can take several times more than that once all the packaging is accounted for. In March, Merced County passed an ordinance that will place new permitting restrictions on some groundwater use, though whether this will affect the Starbucks bottling plant remains to be seen. “We’re cautious about setting precedents,” says Ron Rowe, director of the Division of Environmental Health for Merced County, adding that his agency hasn’t yet issued permits for any company under the new ordinance. Starbucks declined to provide sales figures for Ethos Water, but the company’s estimate of $12.3 million given to charity works out to about 246 million bottles sold. Given the original price of $1.80 a bottle, by my calculation, that’s more than $442 million in sales. While bottled water accounts for just a small fraction of California’s total water use, some residents are nonetheless fed up with bottling plants that profit off their dwindling water supply. Protesters have begun staging events at Nestlé’s bottling facility in nearby Sacramento.